That some authors persist with outdated theories is not because the theory is legitimate and proven. It's simply a sign of bad research or error in reasoning. Built on the unproven belief in Latin-like Etruscan letternames, the Latin word elementum 'letter of the alphabet; element' is further assumed to be Etruscan based on a purely theoretical lettername-sequence of *el-em-en in that alphabet. If el, em and en are already attested Latin letternames, why must we go to the bother of assuming Etruscan origin based on letternames that haven't been attested? Not only speculative but, it must be overtly confessed, absurd. While the Latin alphabet might be divided into two equal, 10-letter halves once we take away the last three Greek-influenced letters (ex, ī Graeca, zēta), the halfway point of the Etruscan alphabet is different as can be seen in the picture above. The halfway point is not el but en. We have no excuse to get rid of the last three letters to make it the required el either. We have no valid reason to go to extra effort to repair this ailing theory with a multiplication of hypotheses. We witness then yet another turkey theory that capitalizes on the marketed artifice known as 'the Etruscan mystery'. "Taboos may even cause the loss of a word, as in the classical Indo-European case of the word for 'bear'. [...] Avoidance of the term is thought to have occurred in the northern Indo-European regions, where the bear was prevalent, and another name, (employed, perhaps, not to offend it), was substituted in the form of *ber- 'brown'; that is, 'the brown one'." Now, upon reading accounts like this, the first question that comes to me is this: How can one know with any degree of certainty that this word had been displaced in Germanic, Baltic and Slavic because of taboo and not because of garden-variety lexical replacement? In Slavic, 'bear' is replaced by a new word meaning 'honey-eater', unrelated to Germanic's choice of 'brown one'. This is exaggerated as a 'circumlocution' in keeping with the assumption of taboo but if these sorts of creative epithets constitute in themselves evidence for taboo replacement, then could we not then claim that any new word coined is a "circumlocution" or "taboo" for the original term? Should we start insisting that Latin aqua 'water' is a taboo replacement for *wódr̥ too? It's rather convenient to pin taboo explanations on the vocabulary of obscure northern cultures that lacked written records. Sure, no one can deny that the bear was a powerful symbol to northern European cultures for millennia, but if we replace 'bear' in the above quote with 'pickle', the emptiness of this taboo assumption becomes a little clearer. I think I might have hit upon the Proto-Aegean word for 'bread' and 'grain'. At the base of this suspicion is Greek σῖτος 'grain, wheat, wheaten bread' which has proven difficult to etymologize into Indo-European terms. The Greek word appears best connected with Assyrian šeˀatu 'grain, barley', feminine derivative of šeˀu which is probably loaned from Sumerian še, but the devil's in the details. What's missing in our picture of the word's hypothetical transmission is the meddlesome four-dimensional hole that hovers over the space between Turkey and Greece and between the periods of the 3rd and 1st millennia BCE. In this case and the many others I've already talked about, it can be filled in by a Proto-Aegean etymon. An Aegean word *sayáta, presumably spoken around 2000 BCE, could reasonably be loaned from šeˀatu. The phonetics in this transfer pose no problems since Aegean languages, like Etruscan or Minoan, show no evidence for phonemic glottal stops. Indeed they show the use of interloping y to break up colliding vowels between stem and suffix, as in Etruscan śealχ 'sixty' /ˈʃejəlkʰ/ < *śa-y-alkʰ (cf. Etr śa 'six'). This 'bread' word can be an added example of this intervening phoneme showing how Aegean speakers would have perceived /-ʔ-/ in neighbouring Semitic and Egyptian languages as just an allophone for /-j-/. Minoan *siata /ˈsiə̯tə/ can evolve from the Aegean root which in turn explains Mycenaean *sitos (written si-to) and later Greek σῖτος. What's uncanny about this adventure in extrapolation here is that there exists an Egyptian scroll recording the existence of an 'Asiatic illness' for which an incantation is recommended in 'the language of the Keftiu' (ie. Minoan). 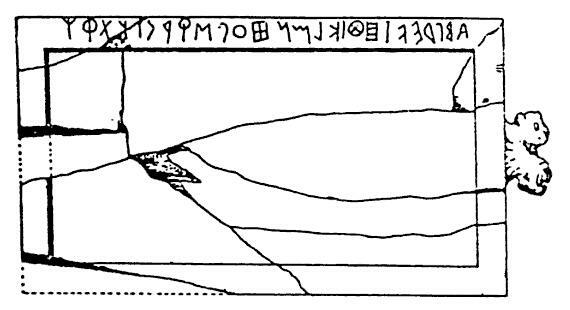 These Egyptian symbols were written out phonetically to reflect actual Minoan words. One of the words is written sata (that is, sȝ-t) and is followed by a bread determinative. This fact teases me to ponder further: Is this so-called bilingual incantation actually just a ritual prescription to placate deities of illness and death with a votive offering of bread? Such a bread offering to heal the body may remind one of later Biblical symbolism associating unleavened bread with the body of Christ. Further yet, if we follow this idea to its full conclusion, one would reasonably expect that Aegean *sayáta would contract to Cyprian *śatʰ according to the rules of Cyprian Syncope as I explored it in a few earlier posts. Strangely, we also seem to have a genitive form śaθaś in the Liber Linteus (LL 3.xviii). 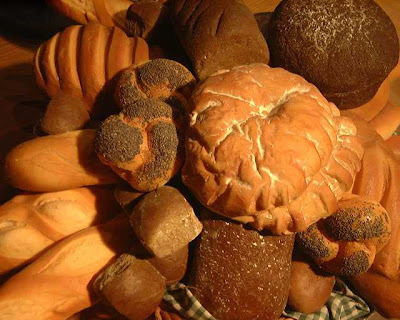 So can the phrase nunθene śaθaś mean '(they) brought some bread' with the genitive being used in a partitive sense, just as with du in French ils amènent du pain? It's worth a shot. In Subtle truths about Etruscan letter-names, I explained why minimal pairs such as bē and pē among Latin letter-names were impossible in Etruscan because the language lacked these voicing contrasts. Surely then such pairs could only be distinguished in Etruscan by Semitic names, similar to those of Greek. There's yet another piece of proof. Letter-names of fricatives & affricates begin with short e (eg. ef, el, em, etc.). Most recent Greek borrowings, hy and zēta, disobey the more ancient pattern. Missing in the above are the outlier letters hā, kā and qū whose exact motivations are obscure. Note the 'three kays' of the Latin alphabet which represented the same sound /k/: cē, kā and qū . What's more, the Roman 'q' was restricted to positions before 'u'. This habit was borrowed from Etruscan which in its oldest stages chose 'k' before 'a', 'q' before 'u' and 'c' everywhere else. Many take these arcane rules for granted but in attempting to solve this mystery, we should also be aware that these same spelling rules were even in effect among early Greeks who used the equivalents gamma, kappa and koppa respectively. 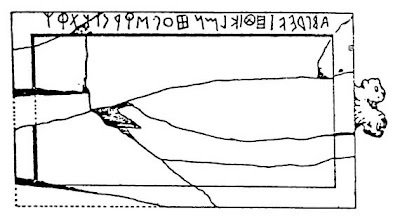 The earliest Greeks likewise restricted koppa to positions before /o/ and /u/, kappa elsewhere. After much thought, I realized that the rule must be motivated by the very names of these letters. Look again at the Greek pair kappa and koppa. Since Semitic /q/ was an exotic sound to Greeks, the functionality of koppa (= Semitic qoph) was modified to convey non-aspirated /k/ just like kappa. To justify the usage of both however, the first syllable of the letter-name koppa must have inspired its eventual restriction to positions neighbouring back vowels in Greek before fading into oblivion. Yet for Etruscan scribes, the merger of phonemic contrasts seen in the Semitic alphabets extended further since voiced /g/ was also a foreign sound to them. A confusing trifold representation of Etruscan /k/ by the three former Semitic letters (gimel, kaph and qoph) was the result. Like Greek but more extensive, a spelling rule seems likely to have been based rather trivially on the first syllable of each of these letter-names. This would help us reconstruct the native Etruscan letter-names for these 'kay' letters. Using Greek and Semitic letter-names as guide, together with this odd spelling rule, I now find myself reasoning that Etruscans had originally called 'c', 'k' and 'q': *cimla, *capa and *cupa. In this way, the first syllables of each (ie. ci-, ca- and cu-) serve as fine basis for the attested spelling rules of Old Etruscan while simultaneously providing an elegant etymology for Latin cē, kā and qū. In other words, when the Romans simplified the Etruscan alphabet names, they simply clipped them down to their first syllable and used them doubly as spelling mnemonics. This devilishly implies separate sources of the Etruscan and Greek alphabets since the required vocalism in *cimla is less like Greek gamma and more faithful to its Modern Hebrew counterpart, gimel. This suggests that Etruscans didn't adopt their alphabet from the Greeks but instead gained the alphabet more directly somehow, directly from West Semites in Asia Minor rather than Euboea perhaps. Bonfante/Bonfante, The Etruscan language: An introduction (2002), p.75 (see link). Here, the spelling rule is mentioned but the authors leave out any further explanation. Woodard,Greek writing from Knossos to Homer: A linguistic interpretation of the origin of the Greek Alphabet and the Continuity of Ancient Greek Literacy (1996), p.161 (see link); Threatte, The Grammar of Attic Inscriptions: Phonology (1980), p.21 (see link). I had reconstructed *camla in previous entries but I reckon that the spelling-rule argument will justify *cimla in its stead. Hamilton, The origins of the West Semitic alphabet in Egyptian scripts (2006), pp.57 & 283 admits to variants for this Semitic letter name: *gaml-/*giml-. (see link). Bonfante, The Etruscan language: An introduction, 2nd ed. (2002), p.52: "On the other hand, the Etruscan alphabet also seems to preserve the traces of a very early Greek alphabet, older in part than the split between 'Western' and 'Eastern' Greek alphabets, since it preserves all three Phoenician sibilants, the signs samekh, sade, and Sin [...], which neither 'Western' nor 'Eastern' Greek alphabet possesses any longer [...]." (see link). Do you think you know your own language? Sure? Are you also sure about the fine lines between language, dialect and accent? Have you ever pondered on how subcultures shape language? Am I the only geek here? Is this mike on?? Well, whatever. Just watch this comedy skit below, a scene from the 1979 movie Airplane!. Sometimes comedy keeps it real. Language is an amazingly flexible form of communication and, yes, it's always funny to watch unsuspecting characters transcend behavioural norms and poke fun at society. In the following two clips, Barbara reminisces in a later interview while both the creators and the two jive-talkers (Al White and Norman Alexander Gibbs) explain the collaboration involved in making this classic scene happen. Continuing with some thoughts I pursued in What sort of 'soul' is the Egyptian ka? 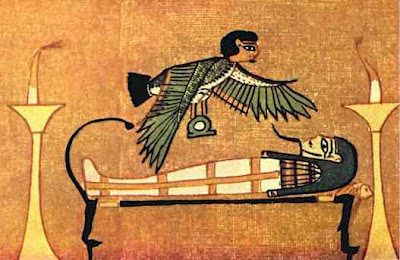 in which I searched for a more comprehensible understanding of the Egyptian concept of a three-part soul, I wanted to delve into the Etruscan notion of soul as it can be glimpsed by various clues in the historical record. 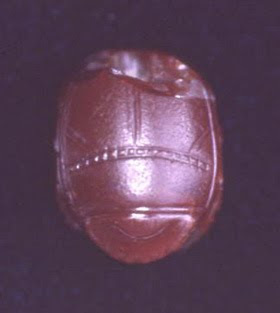 As stated in previous posts, the comparison between Etruscan and Egyptian ontology is motivated by the Egyptian influence quite apparent in Etruscan scarabs found as tomb offerings, invoking the Egyptian god Khepri which, because of the convenient pun in the Egyptian language between *ḫāpar 'becoming' and *ḫapúri 'beetle', had led to the creation of this curious beetle-headed entity representing the rebirth of the sun in the morning horizon and simultaneously also the rebirth of the human soul after death. Therefore, the source of this hope in the deceased soul's rebirth can be asserted with certainty to be Egyptian. Yet if so, this implies that other ontological concepts also were welcomed into Etruria from this North African civilization. So if the Egyptian believed in the ka, ba and akh and if I'm further correct that they represent subsets of each other rather than equal portions of a soul, then what were the Etruscan equivalents if any? If the ka is the soul when unified with the living body, with a representative image, with a statue or with some other sort of physical vessel (as per my previous entry), then it's interesting to note the difference of burial practices between Egyptians and Etruscans. 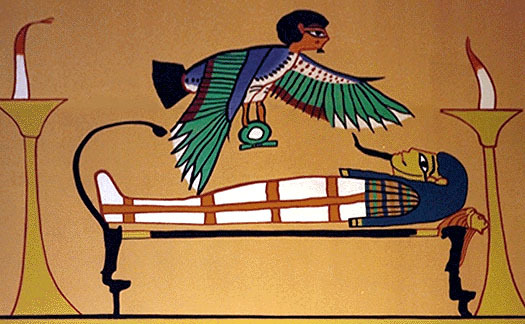 To the Egyptian, the destruction of body in a cremation must have seemed horrible since it denied the ability for the deceased soul to ever reunite with its body again. Yet this consideration must not have fazed the Etruscans. The repeated mention in the Liber Linteus of cletram srencve 'lectica with icons', a portable litter filled with representations of their honoured gods, as well as the habit of leaving useful articles for the dead as if they lived on in the physical realm suggests that nonetheless the Etruscans must have believed that a soul, whether of a deity or a human being, had the ability to reside in physical things much like the Egyptians. The Etruscans believed in their own version of a ka. With the ba translated as the spirit itself (regardless of containment within a physical host), we can be certain that the Etruscans believed this too and so this needs no further explanation. One of the Etruscan terms used for 'soul' appears to be sacni, literally 'sacred one'. We might also translate it as hinθial 'that which is below' which alludes to the soul's destined path through the underworld. The most intriguing part of this comparison though is how the Etruscans might have perceived the Egyptian akh, the most obscure part of their conception of the soul which I suspect might be best understood as 'life-force' or 'will' and thus a component of the larger ba. 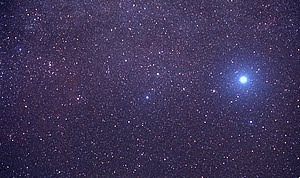 Its connection with stars is particularly interesting because we know that Etruscans conceived of stars as nails hammered in the sky. We also know that nails were employed in ritual (nb. Roman accounts of the goddess Nortia) and that they had a connection with fate and the tracking of time. We know that the nail was associated with the human soul but the confusing imagery of the death god Charun seemingly hitting dead people with hammers as if they were nails befuddles De Grummond who thinks that the hammer was "his weapon of choice" against all who die! Surely not. This is *not* to be taken literally or a sign of Charun's malevolence. This is simply a metaphor of death. Quite simply, when someone died, it must have been believed that a new star would be tapped into the vault of heaven. We can only sensibly interpret the hammering of the star-nail in the sky, the pulum, as being synonymous with the reception of the soul within the gates of the City of the Dead. Yet if so, this parallels the joining of the Egyptian akh to the field of stars that Egyptologists know as the Akhet. I notice Kirkus Reviews' reviewed Rodney Castleden's work, Atlantis Destroyed, which attempts to thoroughly debunk the myths regarding Plato's story of Atlantis. Putting aside certain details, I'm reasonably satisfied with the book. I feel that it's brave of any scholar to explore a topic in depth and its variety of potential relationships by respectfully laying out the supportive facts and reasoning. The reviewer gave a good review too overall but I'm drawn in by the subtlety of his jaded remarks that lie between the lines; the kind of remarks that remind me of the childish battle of absolutist extremes that plays out so often in daily life and in the hysteria-oriented media which strives to make every instance of public discourse an infuriating, hellish swamp of shallow analyses, void of resolution. When ideological extremes are allowed to take control of the podium, there can be no united intellectual advancement, just division, stupidity and hatred. Now, in the review in question, the critic remarks on an unqualified perception of "pseudoscholarly tone", a serious accusation that requires better explanation, while subtly but effectively holding Castleden in jaded contempt for of all other authors prior to him who've abused the topic. Within the essay, another book's suspiciously advertised and compared, Richard Ellis' Imagining Atlantis, also it so happens reviewed by Kirkus Reviews. In that second review, it's explained that "Ellis leads the reader ineffably toward the firm conclusion that Plato invented Atlantis." This seems to be handled as a comparatively better position to that of Castleden, yet this conclusion comes across to me as insultingly self-evident and a lazier position. And so I come to a larger thought about politics, both in and out of academia, that seek to polarize people to one insane extreme or another while ridiculing moderation. Certainly Atlantis is a lightning rod for cranks with ridiculous positions that seek to find meaning in anything and everything without facts. Yet we need to simultaneously be aware at all times of the cranks on the other end of the spectrum who will insist beyond sense that something simply has no meaning or relevance at all. Both sides are destructive parasites to reasoned debate. This is an ageless battle between two equally nutty camps of thought: the relativists and the nihilists. So when an author like Ellis insists that Plato has no influences and that it's purely of Plato's own isolated creation, he is falling into the same trap as the most extreme opposition he seeks to diminish, by insisting as they do on an indefensible position. In an attempt to oppose one extreme with its equal and opposite, one must pretend that Plato's work was spontaneously created in a bubble, snuffing out all other logical considerations, even though this assertion is bluntly counter to reality. I hope we can all agree that there are simply no works ever published by anyone that are not influenced or inspired in some way by the works of others. There is no idea that's not sparked by the idea of another. Originality is ultimately an egotistical illusion, like fruitlessly scanning the ocean to pick out its individual raindrops. 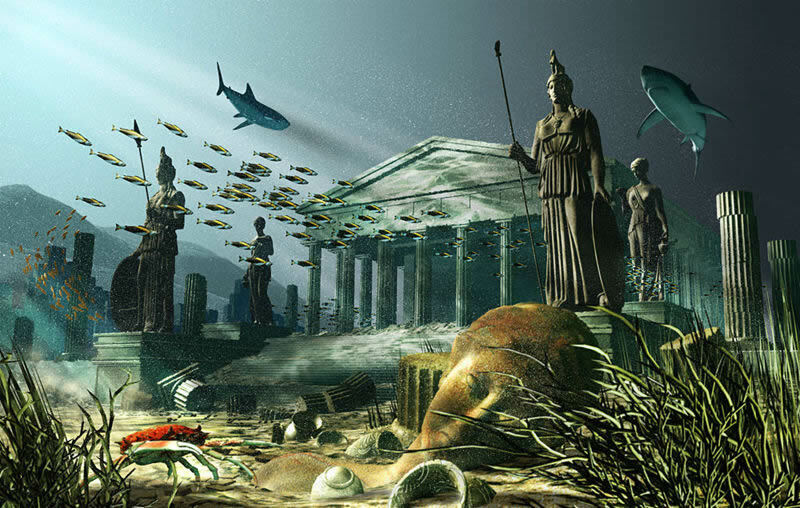 So the story of Atlantis can only be influenced by something other than Plato's own lonely mind. A more moderate position on Atlantis is as follows. First off, yes, it should be quite obvious to the learned historian that Plato intended his entertaining tale to be in allusion to contemporaneous politics and his own theories on building a better civilization. This motive might even be justified as the main force in his recountal of the legend. However we must acknowledge that we have no rational basis to deny a priori other possible sources of this tale if they're based on logical considerations. For me, Plato's Atlantis can validly be seen as a lot of things without this multiplicity being self-conflicting. It's a cautionary tale; it's an illustration of Plato's views on societal progress and morality; it's also most probably a remnant of older tales based loosely on the Mediterranean history of the 2nd millennium BCE. For this topic to be treated with respect, we must avoid absolutes and blind literalism. This is a more well-rounded position; a more complex position. And sadly, moderate positions may forever be too complex to be condensed in a 30-second soundbyte and too bland for the more extremist academics to respect or understand. Have a look-see at the glossary supplied by Decke/Pauli/Bugge, Etruskische Forschungen und Studien, vol 1-3 (1881), pp.89-96. Yes, I know. It was published back in 1881. Now fast forward 121 years to the meager glossary in Bonfante/Bonfante, The Etruscan language: An introduction, 2nd ed. (2002) starting at page 214. If the two glossaries seem effectively identical, it's because they are. So at this rate of breathtaking progress, I shall predict that a published translation of the Liber Linteus will finally be available during a particularly hot spring in 2346. Weiss attempts to crack it by properly noting the preterite verb at the end. However drawing blanks on precise values, he describes hktaonosi as a possible 'pertinentive' and suspects that soromš : aslaš looks like a subject phrase. The last suggestion must be based on his training in Italic Indo-European languages but this language family won't help him here. Scholars agree that Lemnian is related to Etruscan and entirely non-Indo-European. To begin deciphering this inscription, we must first transliterate this inscription better. Since we know from the Lemnos Stele that the Lemnian alphabet used omikron for /u/, we should replace o with u. If anything, this helps make the relationship with 'o-less' Etruscan more obvious, aiding in translation. Also the third item, hktaonosi, is surely malformed since we also know from Etruscan study that this is a language with a fixed stress accent on the first syllable. The cluster hk- is quite impossible so this spelling must either be a transliteration error or a scribal misspelling for, presumably, *hektaunusi. Weiss is correct that the last word is a preterite verb, specifically a perfect preterite which Etruscan marks in -ace. The stem hel- is also comparable to Etruscan where it appears to mean 'to slay, to kill'. This immediately establishes that this sentence refers to an offering being made. We should analyse hktaunusi as a dative in -si signifying 'for' since this case suffix is found identically in Etruscan. Presumably then, aslaś h[e]ktaunusi is to whom the sacrifice was performed. Judging by other inscriptions of this nature, it's no doubt the name of an individual. This leaves surumś, an apparent type-I genitive in -ś which must be what was sacrificed. We arrive at a provisional translation of "[Surum] has been slain for Axulos Hektaion." I presume here that the name of the recipient in question is Greek, a conclusion that I doubt would be objectionable considering its context on an Aegean island. What sort of 'soul' is the Egyptian ka? Now, as I understand it, the Egyptian spirit is often said to be divided into three parts: the ka, the ba and the akh . These names are modern Budgisms based on the vowelless spelling of the Egyptians but I gather that they were pronounced more like *kuˀ, *baˀ and *ˀaḫ respectively at around 1500 BCE. I notice the Wikipedia under Egyptian soul currently claims there are five components of the Egyptian soul but then piles on even more concepts in its schizophrenic, multi-author account. Added is the sheut 'shadow' (or rather *šawīt), the ib 'heart' (*ˀib) and the ren 'name' (more accurately *rin), helping to thoroughly confuse the reader rather than elucidate. I consider these last three related but incidental to the fundamental Egyptian notion of 'soul'. In the following I want to explore a new idea that came to me. The ka is sometimes translated 'soul', sometimes 'image' and sometimes 'double'. Many other translations are also attempted. Yet I wonder recently if this odd translation confusion exists because this term wasn't just referring to the spirit itself as modern theologians might understand it but instead to the containment of the spirit in a vessel, a vessel such as a body or statue. If so, this gives a whole new nuance to the *Ḥáˀat-Kuˀ-Patáḥ, a famous temple in the city of Memphis. It would then suggest that this temple wasn't just housing the 'soul of Ptah' (*kuˀ Patáḥ) but that it was so named because it was believed, at least by its cult leaders, to be the temple in which the very body *and* soul of Ptah was present. This gives me a vision of a grand building within which an impressive, monumental statue of Ptah sits, around which rituals were enacted by its devout priesthood as if he were the living article, all for the wonder of the entranced commonfolk. Such a subtle notion of the word *kuˀ would emphasize this particular temple's central importance to the worship of this god of death and resurrection. Why go to just any temple of Ptah when one can experience Ptah's holy spirit 'in the flesh'? It would certainly have been great temple marketing if my perception here is realistic. Also by reconceiving of the ka as the 'soul' specifically when contained in its physical manifestation rather than just 'soul' proper, contrastively then the ba must be the spirit itself, particularly when it was separate from the *ẖīˀat or body. It would be the ba, I think, that is most appropriately translated as the English-speaking notion of 'soul'. So maybe we can get away with thinking of the ba as a *subset* of the ka rather than on a par with it. This theoretical structure of an ancient belief system leads me to wonder if the akh was in turn yet another subset (of the ba, that is). In the resulting reinterpretation, the soul really isn't divided into three parts, or even five. Instead the soul is composed of three layers with the akh, as 'life-force' or 'will', being the innermost of the three metaphysical strata. In this ontology, the 'will' (akh) is a component of the 'soul' (ba) which is further merely an ingredient in the union of body and soul (ka). I'll have to explore this idea further and see what evidence is in its favour or against it. Ever since I began distinguishing between well-grounded Proto-Indo-European (PIE) roots and mistaken ones built on historical confusion and an unhealthy denial of a non-IE Mediterranean-centered language family, I can't stop finding more issues to write about! I sometimes wonder if the methodology used by Indo-Europeanists truly contrasts that by a Nostraticist or Proto-Worlder, but I try hard to suppress this rebellious, philosophical notion. I'm convinced now that many beloved PIE roots are in reality nothing more than a mirage built on a package of loanwords diffused from an Etrusco-Rhaetic language in the bustling Po Valley of early 1st millennium BCE. The previous reconstructed etyma that I've suspected openly on this blog show specific distribution patterns that imply such a geographical origin. I dare now suspect another cherished root: PIE *h₁em- 'to take'. First of all, Julius Pokorny's 1950's work is online showing his pre-Laryngeal-Theory reconstruction, *em-, justified by evidence found in Celtic, Italic, Baltic, Slavic and Anatolian. At first blush, my skepticism appears too sensational. Yet we can first quickly peck away at the falsely segmented Hittite word *u-emiyami based on *actual* wemiyami 'I find'. The word has been connected with a quite different root, *gʷem-(ye-) 'to come', which happens to be a more convincing etymology. The habit of spelling the syllable we with two symbols, ú and e, instead of just one was a normal Hittite practice, it turns out. So now we're just left with comparanda from Celtic, Italic, Baltic and Slavic - precisely the language groups easily accessible by trade from the Po Valley around 1000 BCE. The meaning of the verb also lends itself well to the language of trade and we may note the coincidence of Latin emere 'to buy' (hence caveat emptor 'buyer beware'). For the purposes of this revision, an Etrusco-Rhaetic verb *em 'to take' is in order to provide the source for the surrounding Indo-European forms. Etruscan evidence is rather easy to find. It's long been noted, thanks to the numerals expressed in the Liber Linteus, that numbers between 10 and 100 whose last digit is higher than 6 are conveyed by subtractive terminology. So while 13 in Etruscan is ci-śar (simply a compound of 'three' followed by 'ten'), 17 on the other hand is ci-em zaθrum, literally meaning 'three minus 20' much like Latin duo-de-viginti '18', literally '2-from-20'. Yet how do we analyse the grammar of this expression? Considering that the infinitive is expressed as the bare verb stem itself as in many other languages, this element em may very well not just mean 'minus' as the Bonfantes suggest but more specifically 'taking away from'. Thus ci-em zaθrum is literally 'taking away three from (ci em) twenty (zaθrum)'. Just like a proper SOV language is supposed to do, the infinitive verb is placed after the noun phrase and thus we know that 'three' is what is being taken away. Its simple preterite form, eme, is written twice in the continuous script found on a cup (TLE 366): nacemeuruiθalθileniθaliχememesnamertanśinamulu. In both these instances, in fact, the verb happens to follow two very common adverbs, nac 'when' and iχ 'thus', guaranteeing that I've properly divided these words. We now need to explain what this root is doing in a non-IE language and the easy answer would be to blame it on loaning from an IE language into Etruscan, perhaps from a language like Umbrian (cf. emantur) or Latin (cf. emere). Yet lacking other evidence outside of this Po Valley trading circle, how can I be sure that this IE root even exists? 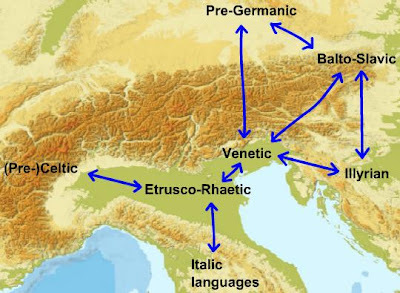 Lacking further evidence, Occam's Razor guides me to the simplest answer, that it was my aforementioned Etrusco-Rhaetic root *em that spread throughout the northern territory into surrounding Indo-European languages. In a manner of comical speaking, these early IE peoples would not only have taken in novel goods from afar through exchange, but also would have taken the very verb 'to take' as well! Surely at the very least it's undeniable that the non-Indo-European language, Minoan, was positively influential on local languages up to 1400 BCE. Study of such a Mediterranean language family is abundantly warranted yet so entirely neglected. In Hittite historical phonology (1999), p.297 (see link), Kimball must assume a compound dependent on a preverbal particle *u preceding an Anatolian root *em-, however note the original etymology given that doesn't require such a faith-based word-slicing in The Classical journal, vol 31 (1936), p.452 (see link) and Sturtevant, A comparative grammar of the Hittite language (1933), p.90 (see link) where the verb is derived squarely from *gʷem-ye-, a construction further attested outside of the Anatolian branch. As per the next note, the division of we- into u-e- based solely on spelling constitutes unnecessary assumption. Melchert, Anatolian historical phonology (1994), p.25 (see link).